Winner of the 2017 Turner Prize, Lubaina Himid’s installations in the Walker Art Gallery, Meticulous Observations and Naming the Money, consider both the everyday and how it can be captured, as well as the glamourisation of enslaved African men and women in the 18th and 19th centuries. Meticulous Observations was curated by the artist in response to a sculpture of Henry Wadsworth Longfellow by Edmonia Lewis. 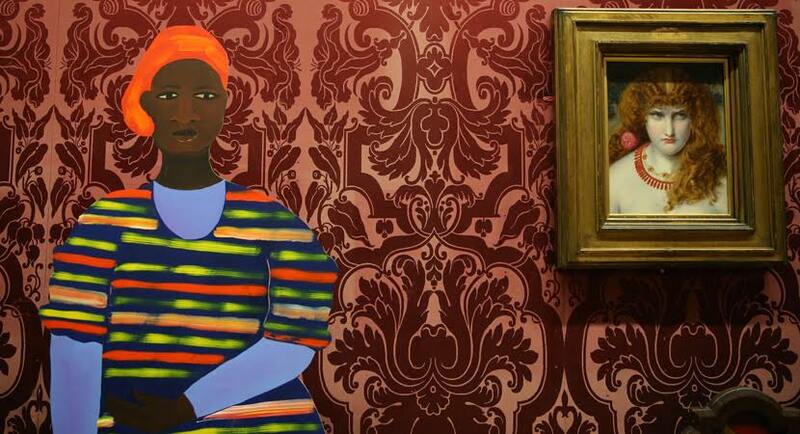 Himid has selected a number of artworks by ten artists, all of whom are women. From Lisa Milroy’s Silverware (1983) to Frances Hodgkins’s Arrangement of Jugs (1938), the works, in conversation with each other, explore themes of domesticity and show an admiration for objects often reserved for function over beauty. Accompanying the selected works is Himid’s own watercolour work, Scenes from the Life of Toussaint L’Ouverture (1987), detailing both the everyday and the heroic life of François-Dominique Toussaint L’Ouverture, a respected military commander and former slave in the 18th century. Within the work, Himid poses questions: “An afternoon snooze | who cooked the | mid-day meal?” Her questions consider history in a different way, focusing on social aspects and opening up events to more than just key individuals. In one painting, Himid asks “did his mother teach him | everything he knew?” With this, Himid draws attention to the role that women have played throughout history. These questions are all asked quietly, handwritten in pencil. There is a transience to them, contrasting against the idea of recording history. Naming the Money, commemorating the 10th anniversary of the International Slavery Museum, features twenty of Himid’s life-size cut-out figures in conversation with other artworks throughout the Walker Art Gallery. It addresses how the middle-class flaunted their wealth in the 18th and 19th centuries through slavery. The figures are of black slaves, placed among portraits and sculptures. Each figure is accompanied by a short poem, titled with their original African name. The poems all follow a similar formula, noting each figure’s new European name and highlighting their skills. They speak of what they have been tasked to do, but all end with statements of pride and strength. Himid’s work gives voices to those who could never speak out and gives insight into their past lives. By placing her work directly against other artworks, Himid disrupts visitors’ usual experience of an historical gallery and asks them to consider another side of history. Himid’s work emphasises the importance of the unnoticed and the unrecorded. It asks us to appreciate the necessity of contribution, and by looking to the past, urges us to be more considerate of others in the future.